I love the visual combination of decadent white and black chocolate in this recipe and the obscenely delicious layer of chocolate on top of the chocolate crust. It is a labor intensive recipe, but worth the work. I suggest you begin this recipe at the beginning of the day or better yet, make it a day ahead. Preheat oven to 350 degrees. Grease a 9X3 spring form pan. 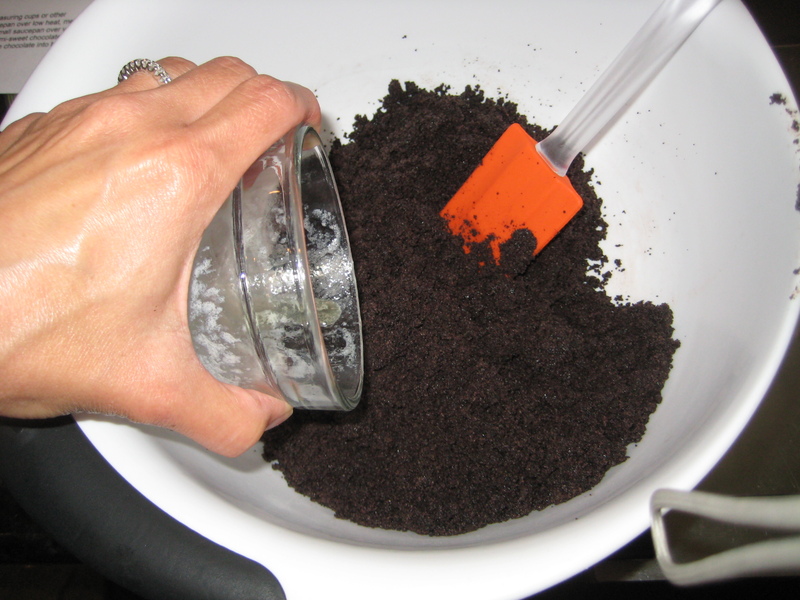 Place Oreos in a food processor and pulse until crumbs are fine. 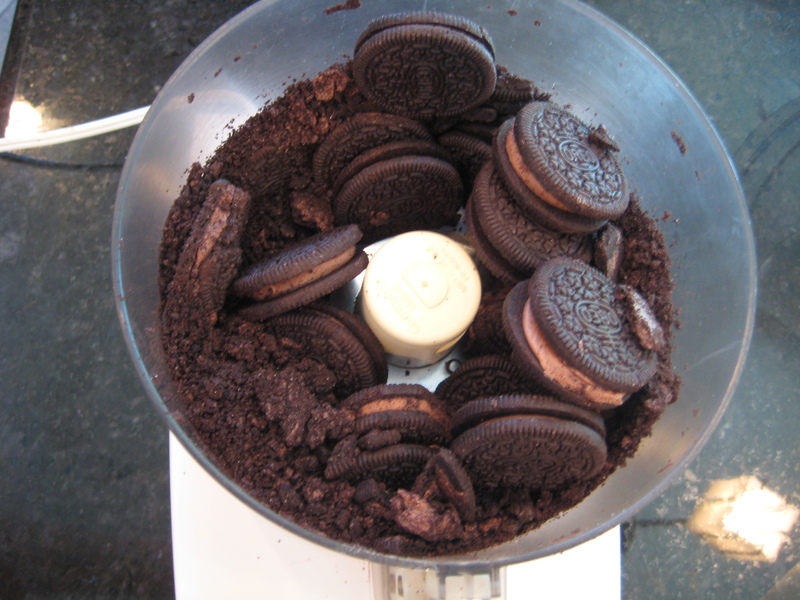 In a bowl, mix crushed Oreos with 3 T of butter. Press crumbs firmly onto bottom of pan. Bake the crust for 15 minutes. 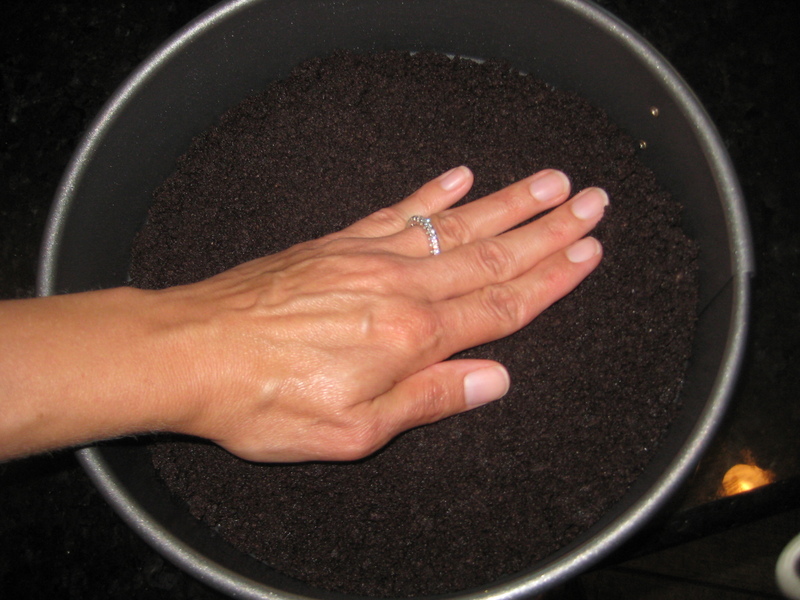 Remove from oven and sprinkle with chocolate pieces. 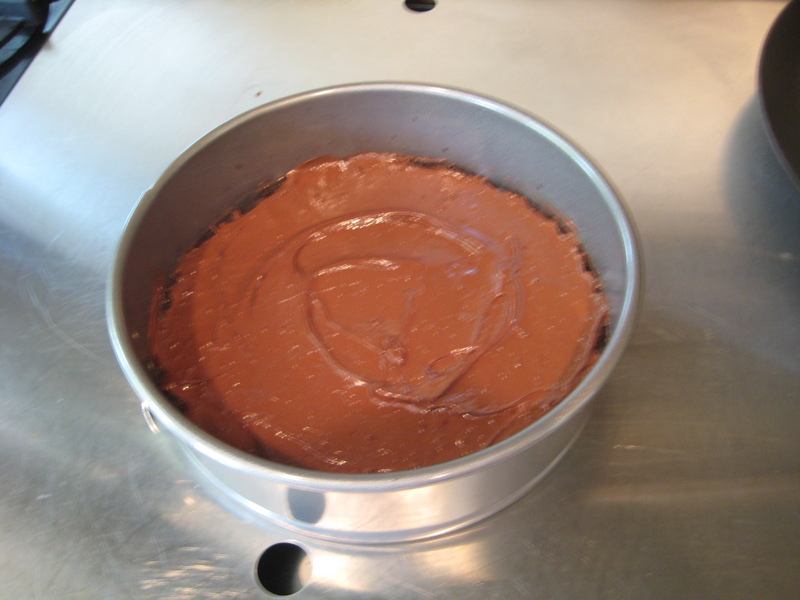 Let stand until chocolate pieces soften, then spread chocolate evenly over the crust. 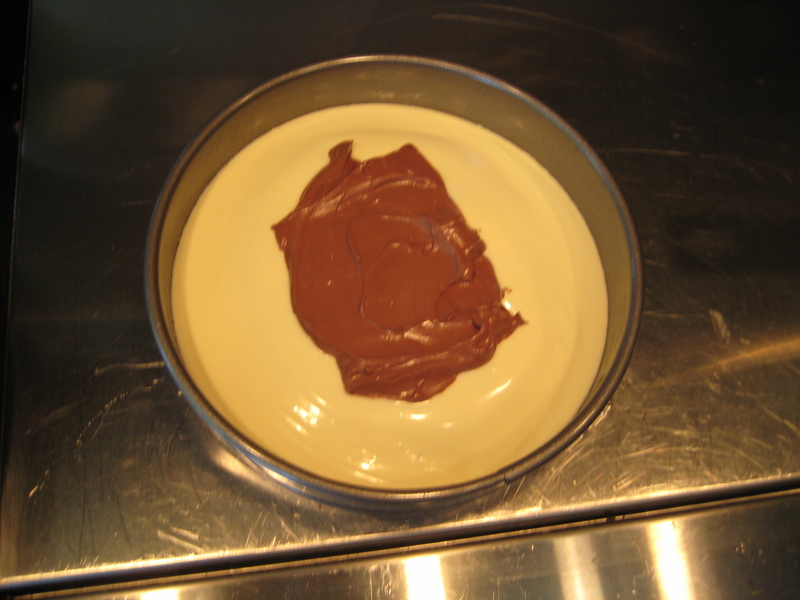 Place in refrigerator to chill until you finish mixing the filling. 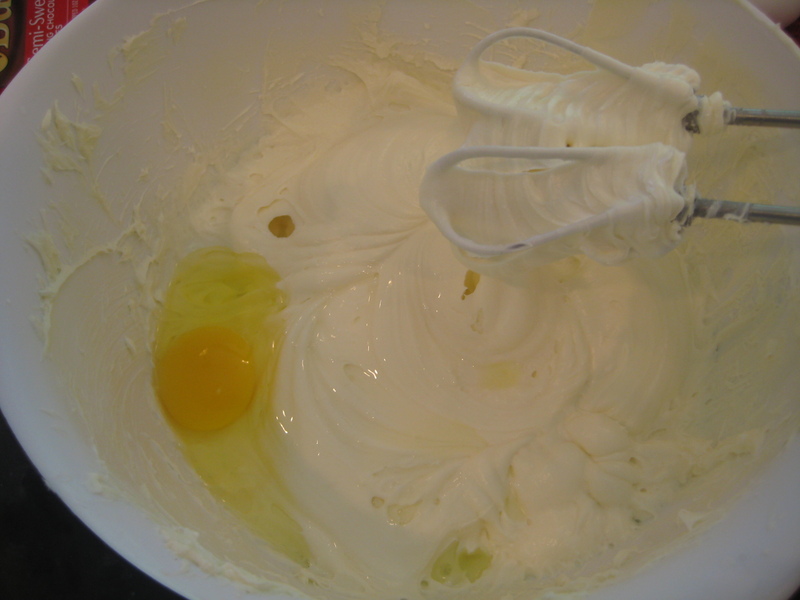 In a large bowl, use mixer on medium speed to beat cream cheese until light and fluffy. In a small bowl, mix sugar, cornstarch and salt. 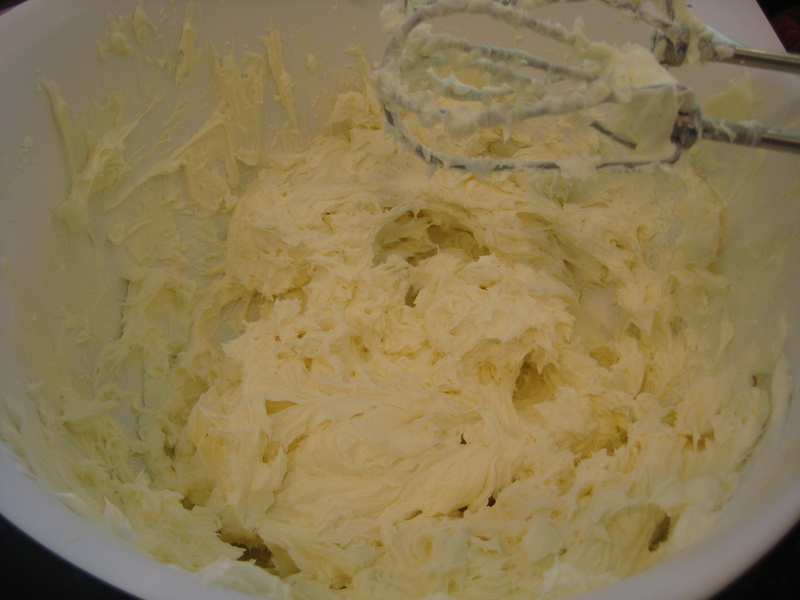 Gradually mix into cream cheese until well blended. With mixer on low speed, gradually beat eggs in one at a time, sour cream vanilla and 1 C heavy cream (reserve ½ C for glaze later) until blended and smooth. Divide batter evenly into 2 (4-8 cup) measuring cups with pouring spout. 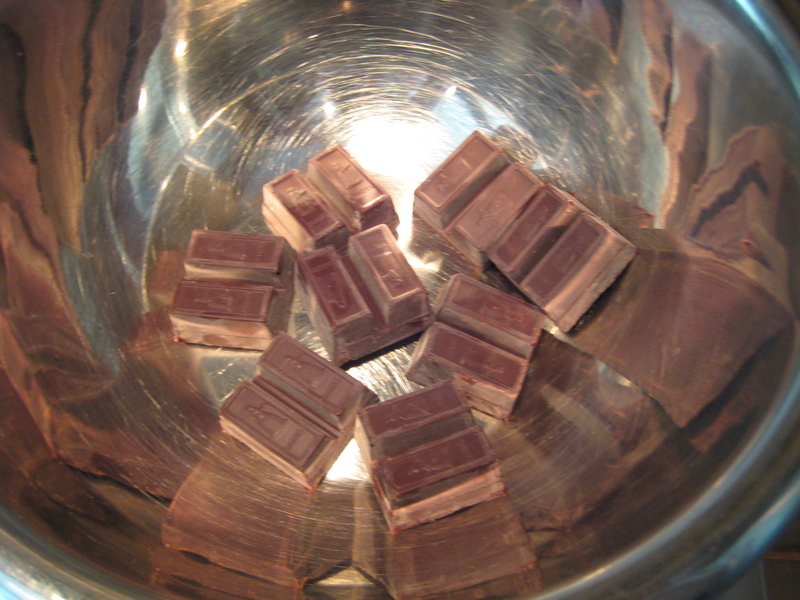 In small saucepan over low heat, melt 8 oz squares of semi-sweet chocolate. 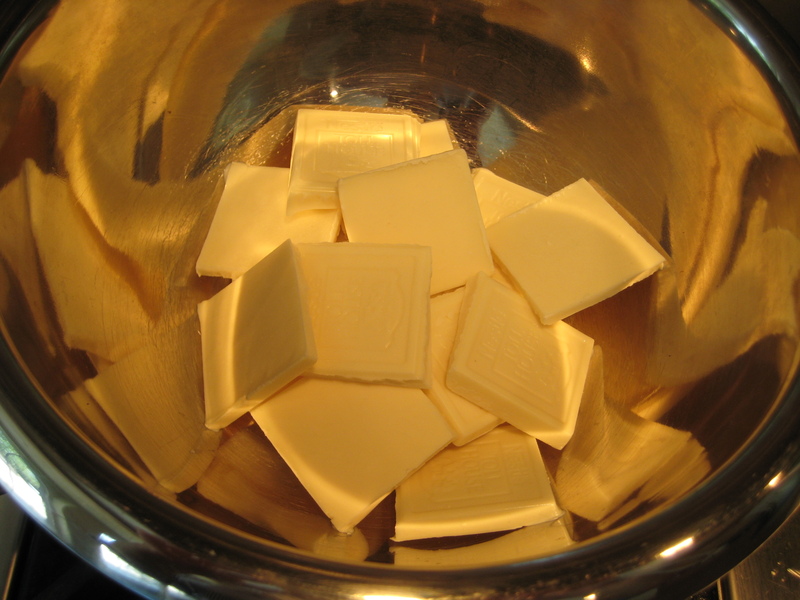 In another small saucepan melt 8 oz of white chocolate. 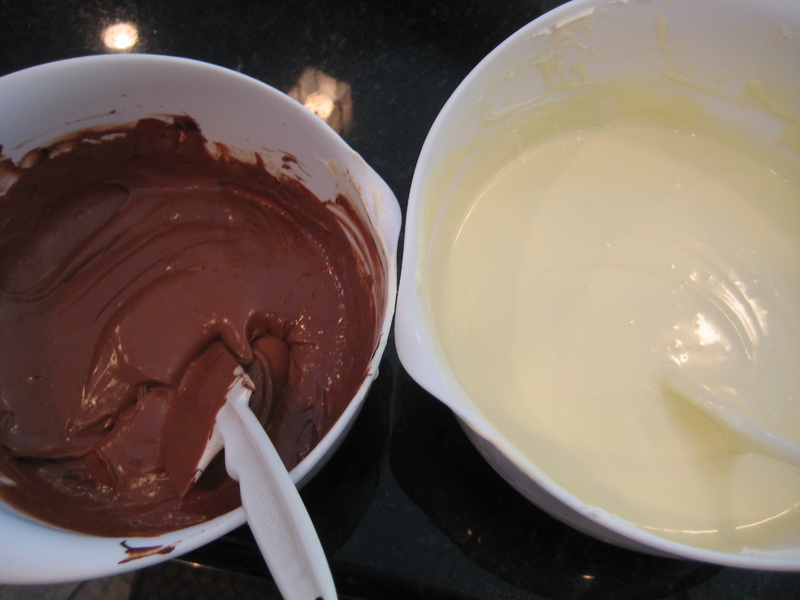 When melted smooth, mix white chocolate into one bowl of filling and mix the semi-sweet chocolate into the other bowl. Make sure the filling is evenly divided or the batter will not pour into properly. 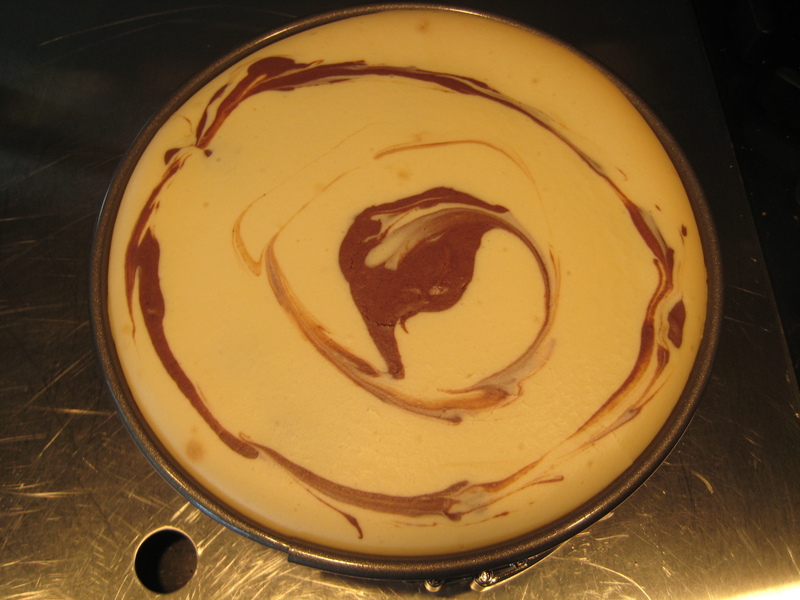 The Zebra stripe design is achieved by alternating pouring the filling into spring form pan. (This is difficult so don’t panic. Do the best you can because it will look dynamite even if the pattern is a little less even than you desire.) Pour half of the dark batter into the pan. Then pour white batter from 2 feet above pan directly into the center of the dark batter (the height will force the center of the cake to be pushed to the edge of the pan. Alternate pouring white and dark batter about 3 times decreasing the amounts of batter each time and ending with white batter. The batter should resemble concentric circles. 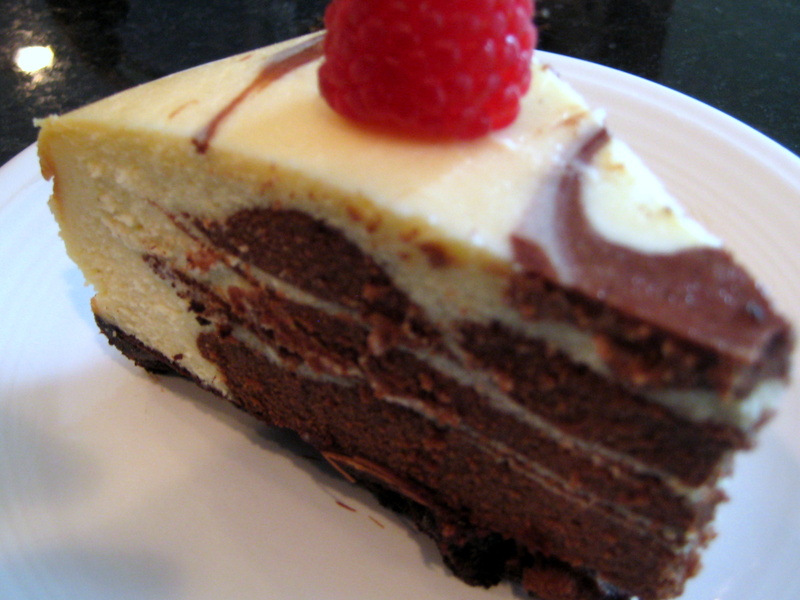 Bake cheesecake 30 minutes. Turn oven to 225 degrees and bake 1 hour and 45 minutes longer or until center is set. Turn off oven; let cheesecake remain in the oven 1 hour. Remove cheesecake from oven. Run thin bladed spatula or knife around edge of cheesecake to loosen side of pan. Cool cake in pan on wire rack. Refrigerate at least 6 hours or until well chilled. Optional glaze: About an hour before serving prepare the glaze. In a quart saucepan over medium heat, heat remaining ½ C heavy cream until small bubbles form around edge of pan. Remove saucepan from heat. Stir in remaining 4 squares of semi-sweet chocolate until melted and smooth. Cool glaze about 10 minutes. Meanwhile, carefully remove cake from pan to cake plate; with spatuala, spread glaze over top and side. Refrigerate 30 to 45 minutes until glaze is set. If you like, garnish with whipped cream and raspberries. Begin alternating pour of filling. My chocolate was a bit too thick because I had an unequal amount of batter divided. It will still work, but won’t pour as well. My dark filling stayed in the center when it should have pooled out more when white batter was poured onto center. Just a small mistake can change the look, but doesn’t ruin by any means.